Zoltan Sholtes was a Greek Catholic priest who was born in Slovakia, in a small village called Priekopa, district Sobrance, and he lived in Uzhorod his whole life. 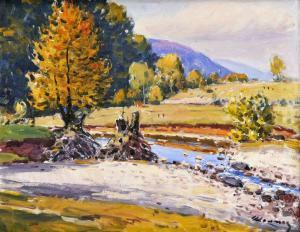 He died in 1990 as a leading figure of the Transcarpathian School of Painting, leaving behind a legacy of touching, warm, mostly winter landscapes in a much impressionist style. Similarly to his colleagues in the second generation of the School, his artistic vision and style was unique, and while drawing from their teachings, he never mimicked them. His paintings are auctioned out from $500 to $2,000.